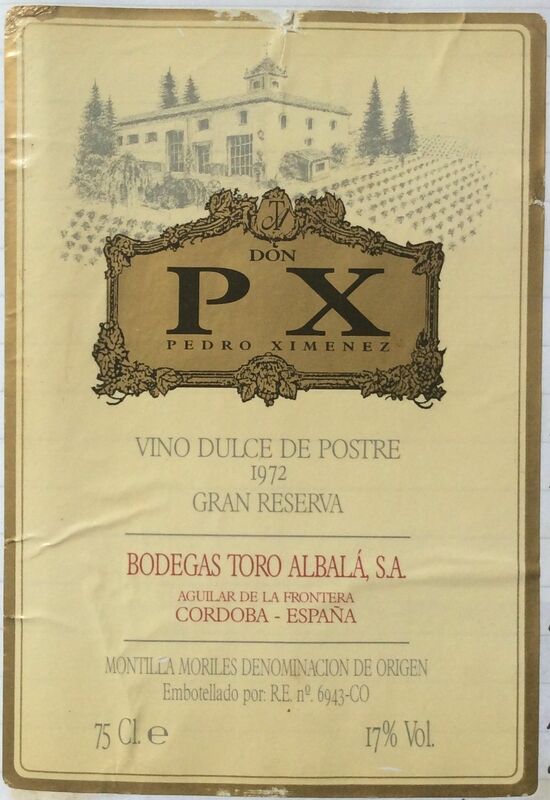 Technically not the same as PX from Jerez, but actually very similar in texture, compared with Malaga for example – this one’s from Montilla-Moriles but prepared in a similar way (extensive oak ageing) to the Jerez type. Really complex, rich and thick. Deep, dark brown, but brick red-brown rather than golden-brown. Thick and intensely concentrated. Hint of cloves, cinnamon, toasted brioche spread with caramel (! ), raisins, toasted walnuts, and above all coffee-cream. Soft and rich mouthfeel, but which starts with slightly acidic grip round the edges of the tongue. Then fills with spicy – rather than intensely-sweet flavour – caramel and black-treacle bitter / spicy-sweet. Good flavour with a long spice then cream-caramel finish. Very enjoyable. Over ice-cream too.